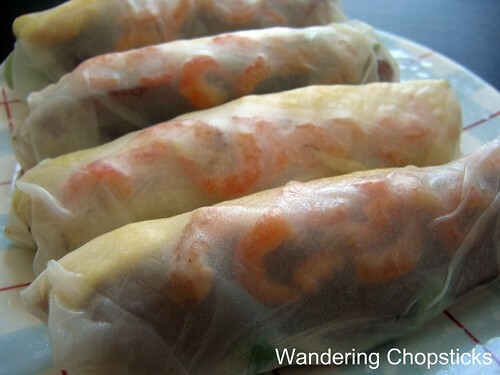 Bo bia are the Vietnamese spring rolls version of popiah, a Hokkien-style spring roll popular in Singapore and Malaysia. (If you sound out bò bía with the proper Vietnamese accent marks, they both sound similar. This is not to be confused with bò (beef) and bia (beer) with no accent mark.) 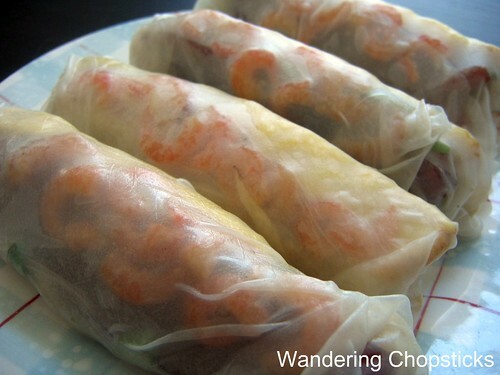 The fillings are slightly different and the Vietnamese version uses rice paper wrappers instead of wheat, but in both versions, the spring rolls are stuffed with shrimp and jicama. Hokkien cuisine hails from the Fujian province of China, and I can only assume that immigrants must have brought the recipe with them and then adapted it when they dispersed to Singapore, Malaysia, and Vietnam. I also remember eating a Thai version once long ago, and am assuming that's courtesy of the Fujianese again. Bo bia are a common street snack in Saigon, where many Fujianese immigrants settled. Noodlepie has pictures of a Saigon bo bia streetseller. I found a bo bia recipe from Playing with My Food and did a little tweaking with the recipe. 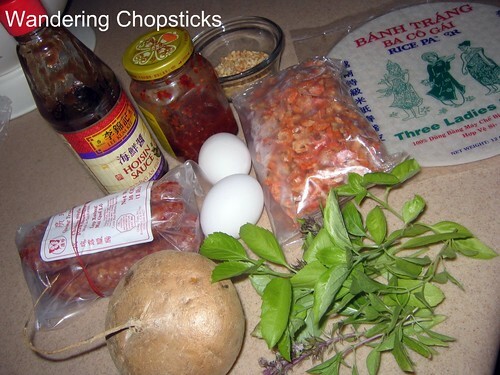 Read my previous discussion of banh trang (rice paper) -- how to wet it, roll it, and preserve it. 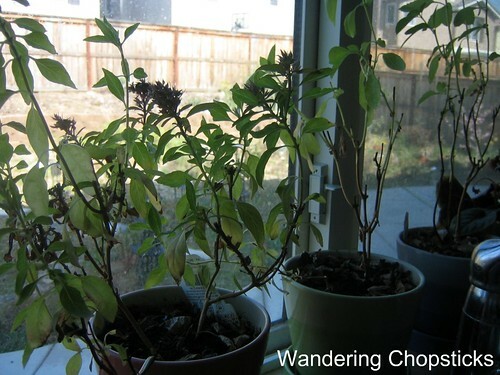 This recipe also gave me an opportunity to use the very scraggly potted basil plants I have in my kitchen window. I saved the flowered tops and put them in a vinegar bottle to make basil-flavored vinegar. Spring rolls should not be made more than one hour before you intend to eat them as the rice paper will revert back to its hardened state. You can also prepare all the ingredients and let your guests make their own bo bia spring rolls at the table. Take a small handful of dried shrimp and place in a bowl, filling with water until just covered. (The following steps don't necessarily have to be performed in this order but I try to dirty as few pans as possible when cooking for less cleanup afterward.) While the shrimp is soaking, finely shred or julienne jicama and set aside. You can also do this with carrots for additional flavor and color. I would have but I didn't have any in my fridge. 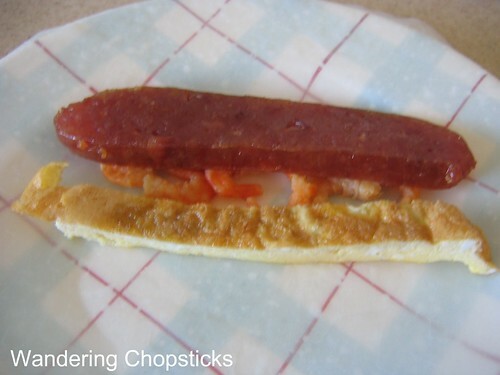 Then beat 2 eggs with a dash of fish sauce and make a thin egg omelet. Slice into lengths and set aside. 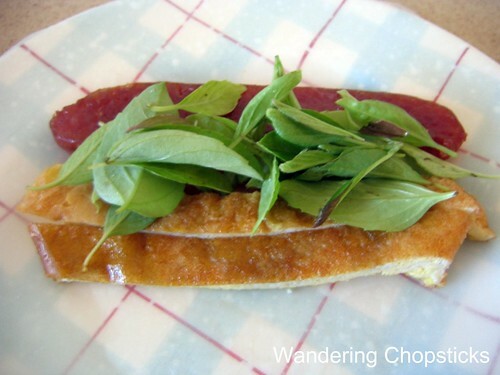 Slice Chinese sausage lengthwise and saute in pan until slightly crisp. Drain fat. Saute jicama (and carrots if any) until softened. Set aside and save any juices. Saute soaked dried shrimp, saving the soaking water. When shrimp is slightly softened and warm, set aside. I just left everything on my cutting board as shown below. If you're serving this to guests, just arrange everything on a large platter, or separate smaller plates. Add the water from the soaked shrimp and the juices from the jicama into the pan. Add the hoisin sauce and chili sauce and stir until thoroughly mixed. If there's not enough liquid, add more water so that you achieve a dipping sauce consistency. 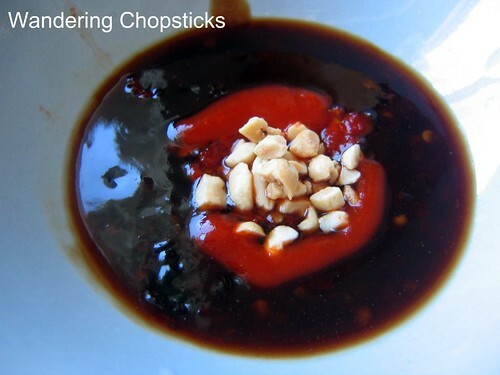 Pour into bowls, swirl some more chili sauce in the center, topped with crushed peanuts. Now as for wrapping, this is purely for my sense of aesthetics. 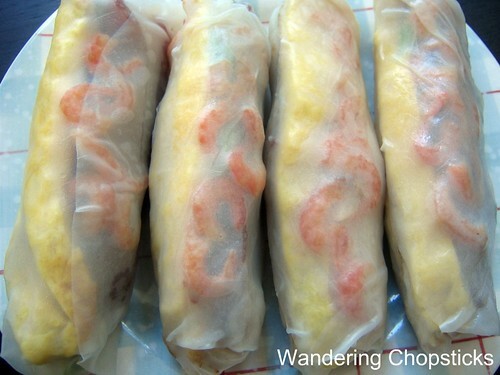 Wet your rice paper, arrange small row of the shrimp, with the Chinese sausage and egg omelet (pretty yellow side facing out) on opposing sides as shown here. Add the basil next so that the green leaves show through the shrimp. 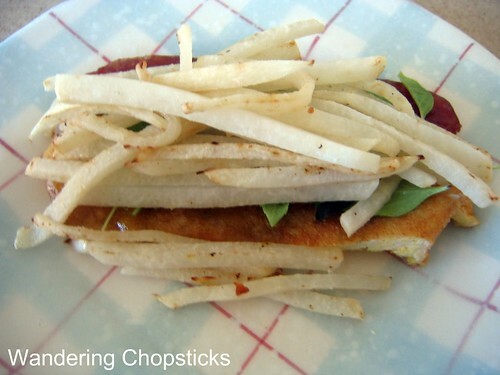 Top with jicama. If you're not experienced at rolling rice paper, don't load up the jicama like I did. Less is better. Voila! Look at the pretty colors - the yellow egg omelet, the pink dried shrimp with a hint of the green basil behind it, the red Chinese sausage on the side. The reverse is just the boring white jicama. And another shot of the other direction. 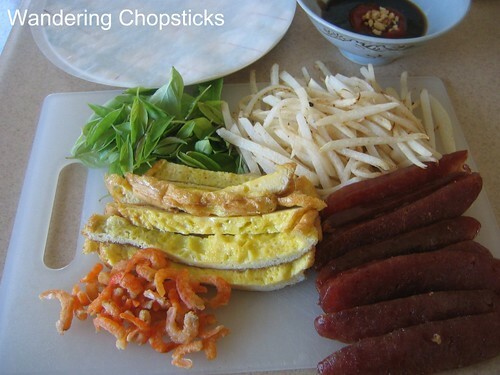 Grating jicama on the large holes and julienning the Chinese sausage makes the spring roll filling a little softer and looser, easier for wrapping and eating. I also made another dipping sauce by combining Chinese satay, hoisin, and chile sauces. A more recent photo can be found on my Instagram. They sound the same, with that "b" or "p". You know, I did not even bother to find out last time if the popiah I've had in S'pore is hokkien or other style. But I know it requires a lot of work (eg. shredding thin the turnips, carrots) during preparation. 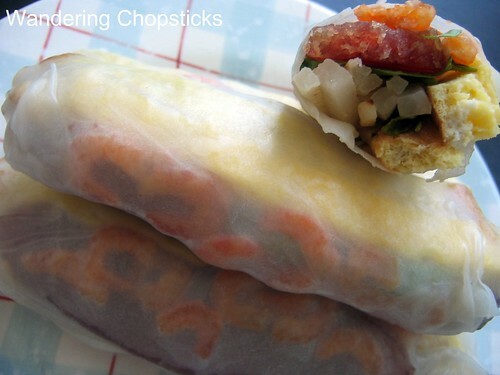 Have you tried the hokkien-style popiah before ? This looks GOOOOD! and I particularly like the step-by-step photos. It's too bad my restaurant recommendations are far from you and vice versa. I'd love to try some of those Vietnamese places in Westminster / Garden grove and I still have Seol Ak San high on my list of places to eat. I tried these at Brodard (I think) a few weeks ago. I really liked them. Your's look even better. yum yum yum! i heart this stuff. i love the peanut sauce. 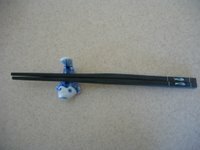 :D i can eat it w/ a spoon. That's quite a compliment since I can't match your photography skills. And I know! I want $2 saketinis so bad! I don't remember seeing these on Brodard's menu. They specialize in nem nuong and chao tom spring rolls, not bo bia. Great recipe, WC. I'll be making this soon. The step by step photos are really helpful (as usual). Thanks! I'll look forward to seeing your version. I had this at a restaurant 2 weeks ago! I love this dish! First it was a bit strange because of the combination of dried shrimps and sausage...but as I went on eating it, I fell in love with it. Great site! I loveeee Vietnamese food! It was the combo of jicama, eggs, and sausage that threw me off when I first tried this. After a while though, all the flavors grew on me too.